little bits of my (and our) life as well. What we cook and eat and live every day. years, it has grown to be more than just mine. know that to me, you are all the bee’s knees. part of this blog as well. And for that I’d like to say THANK YOU!!! can also send a message via Twitter @80breakfasts. The year’s end is almost upon us and it will soon be time for another set of resolutions…maybe you can help me with my list. – Whisk 1 egg and the milk until fully incorporated. Place the mixture in a shallow bowl. the other slice of bread. control the thickness of your slice. the bread as thick as the depth of the egg in the bowl. Pretty clever, huh? farmer waved a bouquet of wild arugula at me, knowing how much I love it. to that extent, a part of my life. Hmmm, all the stuff you post are quite good already. Just post more good stuff. I like that you have different ways to cook something-like eggs or oatmeal. So, it's really nice that you make fancy stuff of regular breakfast fare. My favs are your savory breakfast recipes. Thank you for so many good ideas — request even more, please! I've done this recipe a little different before but it is yummy! I top it with a slice of swiss bread and a salad made with arugula, bacon bits and balsamic! I love yours though, will try it! Egg with french toast? I love it! What a great presentation! Hi Shalum! Thanks for the feedback and for always coming back for more 🙂 Much appreciated! Hi Lula! Love the sound of that salad with this…must try! When I make french toast, I use day old bread. And yes, if I cannot find the french toast sliced loaf, I buy a whole loaf and slice it myself. Some people will use day old bread, soak it in the egg batter and leave it for a few minutes before actually "frying". I don't like mine too soaked up so I just fry it as soon as it comes out of the batter. Using day old bread will give you the same result but eliminating the wet/ soggy texture in most french toasts, even if you (accidentally)leave the bread a tad too long in the batter. I love the idea of a french toast in a whole…takes it to a new level. Hi Peabody! It does 🙂 I like it too! I'm reading this at my work-desk and wondering how gorgeous this would be if made with a slice of rye, a fresh duck egg, and some homemade sausage patties. Ah, bliss…! This looks fabulous. I haven't had time to cook breakfast in months, but this weekend I will, so think I'll be trying it! Hi there! I peek in but rarely comment – am' shy, hehehe! Whatever you post is just ok with me. There's such a homey fun feel in everything here, kinda' like you're cooking with all of us in your kitchen as well. I'll have to go through your other posts later and take notes. Thanks truly for the food – AND – the vibes! Hi Midge! That does sound blissful! That looks like the perfect breakfast… I need sausages! 6 years – Time flies! I love this. Will have to try it soon! 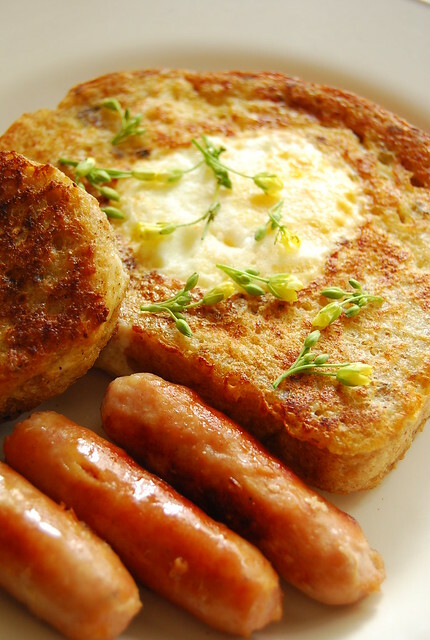 I love the nostalgia of eating the egg in a hole with some maple sausage links or bacon, GREAT post! Always easy and fun recipes! I'm also glad to see that you are involved and care about your blog! Hi Paz! Hope you like it! OMG! This picture just made me soooo hungry. Thanks! Looks like I am making "Brinner" tonight! Just discovered your flog today, and I'm thrilled by what I see. I grew up with a dad who loved making "goo-goo eyes" like these, but as an adult when I've made them they've always left me thinking something could be stepped up. And you've done it! This is the perfect combination, goo-goo eyes with french toast. As for suggestions to write about, when my best friend and I go out to the farmhouse he rents. We always pick up fresh eggs from one of the local farmers and Greg often makes "shrimp and eggs". Sounds unusual, but is so delicious. I'm not privy to his recipe, but I know there are scallions and some worcestershire in it. It's pretty basic, but oh so good. Just an idea, since you asked. Can't wait to read more from you.